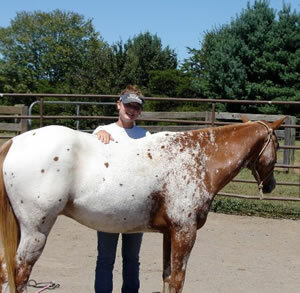 At Black Fox Equestrian Center, we reward hard work and dedication by allowing students that want to know more about horses - and do more with horses - the opportunity to do so by combining learning the basics of horse ownership (and learning to be horse savvy) in a summer-long, "hands-on" working experience. Though it's not all fun and games, it can be a very satisfying experience to work in an equestrian environment on a daily basis and learn the ins and outs of raising and showing horses. Students interested in being a Working Intern needs to enjoy being around horses and working in the barn. They need to realize it can be be hot, dirty work! We have found that for those with the "horse-love bug", this type of daily experience and creative learning is a labor of love and can be totally fulfilling! Participants gain experience in horse handling, grooming, barn management, stall cleaning, farm upkeep, landscaping, building trails, saddling and assisting the trainer or coach. Bonuses may include horse-riding lessons and possibly show experience for the most committed, dependable, and hard-working Interns. We look forward to sharing this opportunity to be a Working Intern with more participants! Are you a high school student, a graduating senior, or even an adult horse lover who wants to pursue a career in the horse business but doesn't have the means to have your own barn or the credentials to work for a world class barn yet? Black Fox Equestrian Center offers a strong foundation in horse care, barn management, colt starting, training for casino online the show pen, grooming, showing, etc., in their Assistant Instructor/Trainer program. Our program allows participants to work alongside our full-time trainers and instructors to learn the ins and outs of the day-to-day jobs and work schedules of the horse business. Because there are lots of stalls to clean, numerous horses to groom and bathe, and heavy saddles to lift - horse work is demanding work, but being around and working with horses on a daily basis can be lots of fun and personally satisfying. By learning from an equine professional, you can also prepare yourself to earn a living in the equestrian field, own your own horses or run your own barn, and find employment with other equine professionals. Schedules may include 4-6 days per week, 5-8 hour days.